In the first UK exhibition to explore the vision of the architect Lina Bo Bardi, the Henry Moore Institute focuses on her drawings for the iconic Museum of Art in Sà £o Paolo (MASP), designed and built between 1957 and 1968. The exhibition presents drawings from the Instituto Bo Bardi which explore her ideas for the exterior and interior of MASP, including displays for the art collection as well as the ways in which the whole site might be used as a public space. 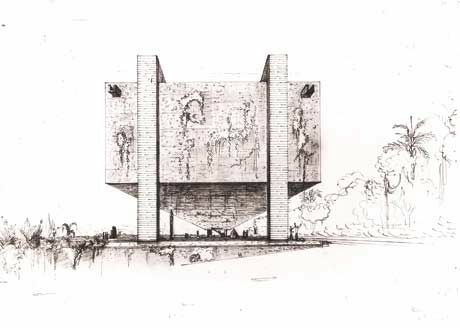 Bo Bardi did not make finished architect's plans, instead creating informal and spontaneous drawings, incorporating pencil, pen, watercolour and collage, which give a unique insight into her creative process and show a monumental building humanised by people, plants and sculptures. Bo Bardi's audacious design presented an ingenious solution for an oddly-shaped, hillside setting and the height restrictions of the city planners. She arranged the building in two parts, one raised up on enormous concrete columns, the other half-buried. This in turn created a third space, the void between the two, which Bo Bardi envisaged as a âbelvedere'; a meeting place for work and play; an open arena for gatherings, exhibitions, festivals and even a circus big top. For the interior she devised a striking mode of presentation, with paintings removed from the walls and supported by freestanding glass âeasels' sunk into concrete, accompanied by seemingly floating sculptures on transparent blocks. Bo Bardi's vision for public buildings reflects a wider post-war interest in facilitating leisure as can be seen in contemporaneous projects such as London's Barbican Centre developed by Chamberlin Powell and Bon. Born in Italy in 1914, Bo Bardi studied at Rome University and later worked for Gió Ponti in Milan. In 1947 she moved to Brazil with her husband, Pietro Maria Bardi, who had been invited to found and direct a museum of art there. She was granted Brazilian citizenship in 1951. She won commissions for many private and public buildings in Brazil, though the Museum of Art was probably her greatest architectural achievement. She also made her mark in the wider cultural sphere, having turned her hand to furniture and jewellery design as well as theatre and exhibition projects, working right up until her death in 1992. As the most successful female architect of her generation, Bo Bardi was an important figure along with the likes of Oscar Niemeyer and Lucio Costa, in what was a period of architectural brilliance in Brazil.